The mosaic was assembled from dozens of images taken by Curiosity’s Mars Hands Lens Imager (MAHLI). They were all taken on January 23, 2018, during Sol 1943. 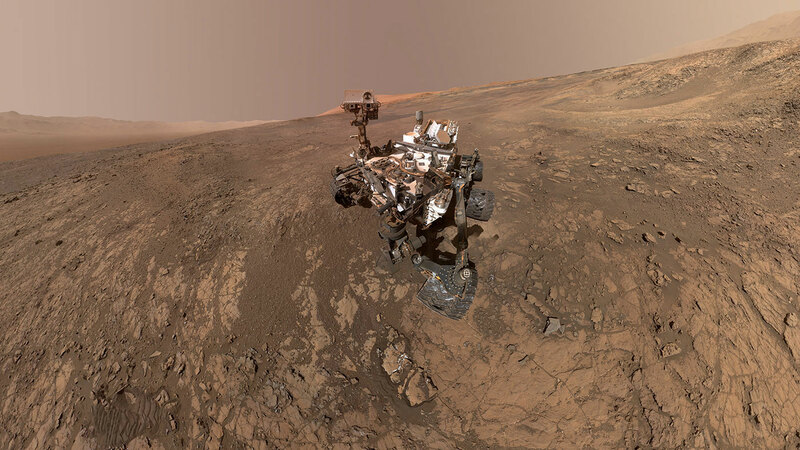 In this first episode of The Mars Report we celebrate the 14th anniversary of the Opportunity rover; show you a recent panoramic view from the Curiosity rover; and recap a “cool” discovery of ice deposits spotted by the Mars Reconnaissance Orbiter. Also, we look forward to the InSight lander, heading to the Red Planet in May 2018. 1 Comment on "New Self-Portrait of NASA’s Curiosity Mars Rover on Vera Rubin Ridge"
Almost forgetting we have that vehicle on Mars. There was a time when that was really news but with SpaceX rocking that space, I can almost yawn at it.